"Ladies and gentlemen," the committee chair said, calling to order the newly sworn in senators. "We have important business to consider today. The Chesapeake Bay Watershed needs our help to lessen nitrogen run-off – and its environmental impacts." The chair of the Environment and Public Works Committee banged her gavel. And the senators, grouped by state, then discussed and debated options, courses of action, and funding. Working toward consensus, the senators determined how much to spend on each option, then voted on the final bill and talked about the legislative process and what they learned. This was no ordinary committee hearing. On this December day, the committee, its chair and ranking member gathered not in the Dirksen Senate Office Building, but in the Capitol Visitor Center (CVC). 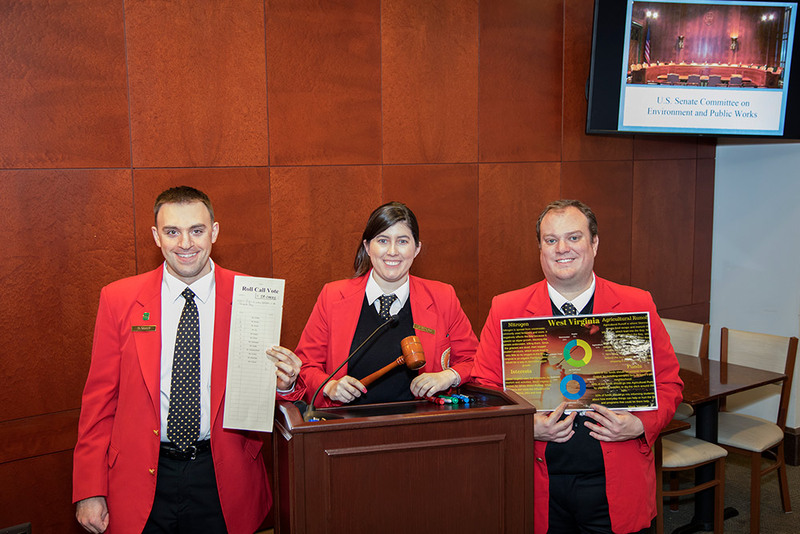 The committee chair and ranking member were not members of Congress; they were visitor guides wearing their trademark red blazers. 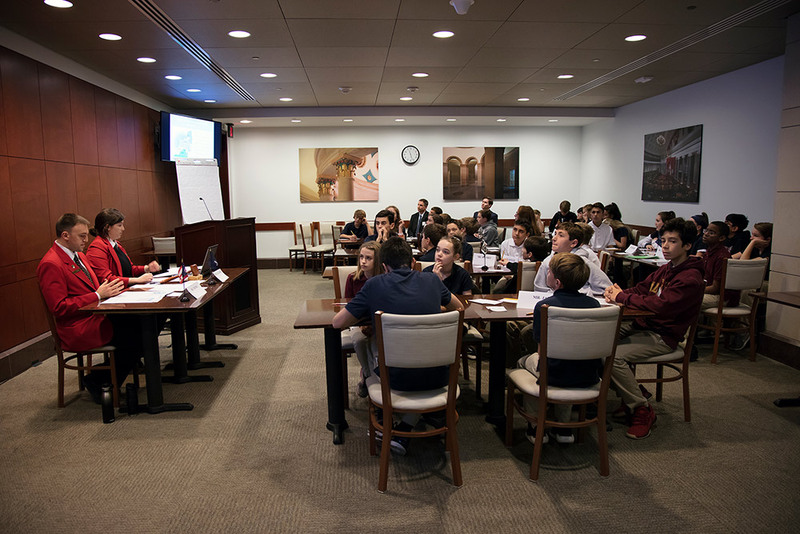 The senators gathered to debate legislation to help the Bay were seventh graders from the Severn School in Severna Park, Maryland. Visitor Guide Carrie Gallagher played the part of the committee chair and Andrew Tremel was the ranking member. The two art programs meet common core state standards and national standards for the visual arts. Environment Matters meets common core state standards and national standards for civics and government. The Severn School teachers went even further. The teachers began working this summer with CVC Educational Program Manager Lauren Windham Roszak. With Roszak's assistance, the teachers – who taught science, English and government – set up their semester's curriculum to pair with the Environment Matters program materials and to culminate in the visit to the U.S. Capitol for a live debate and mock committee hearing on the health of the Chesapeake Bay. Visitor Guides Andrew Tremel, Carrie Gallagher and Brandon Hintze who made the Student Program so successful. Seventh grade team leader Kathleen Donovan said, "Throughout this process, students learned, experienced and watched the law-making process in action. Seeing the government in action made the material real and relevant for students. Many students came away from this unit with a strong desire to vote at age 18, to get their families more politically involved and to potentially run for office." Roszak said, "It was a pleasure to work with a school that was excited to incorporate civic and legislative education into multiple facets of their curriculum. Our team was excited to see seventh graders debate and take a sincere interest in the health of the Chesapeake Bay. We look forward to finding ways to increase the number of schools partnering with us on such a large project." Thank you, Laura, for this great piece. Keep up the great work, everyone! Great work Lauren, Carrie, Andrew and Brandon!! You all inspire me everyday. Thanks for bringing civics to life, for these students and for hundreds of thousands more from around the country each year.